X-TRA NORMAL 8.75" EXTRA NORMAL MODERN BLACK/WHITE ROUND WALL CLOCK - Extra Normal wall clock in black by Ross McBride. This very unique modern wall clock was designed by Ross McBride for Normal Timepieces in Japan. 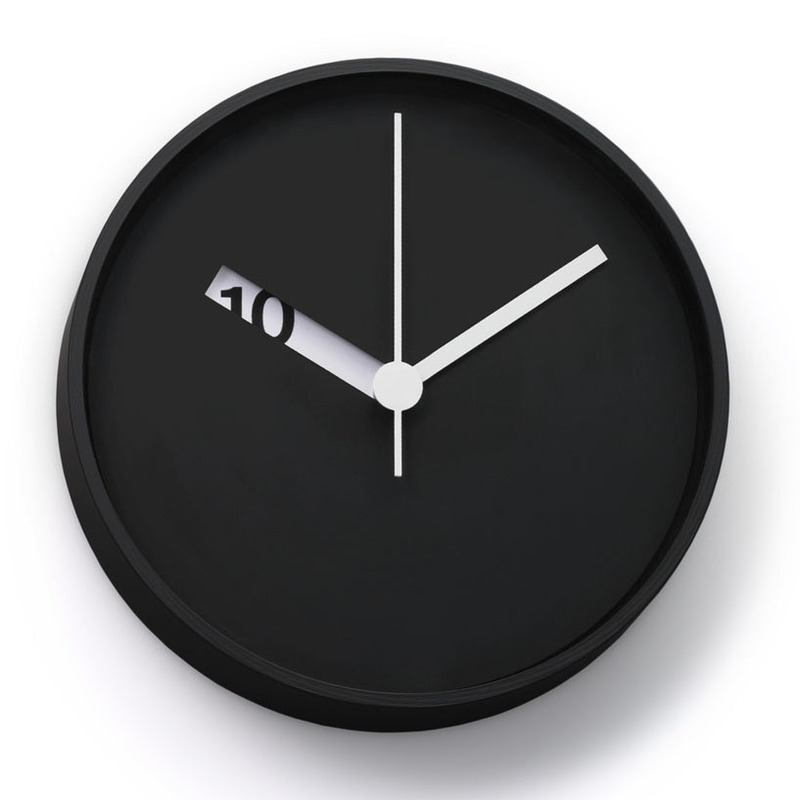 The Extra Normal wall clock by Ross McBride is a modern wall clock with a black face. Examining the subject of "time" has always been a fascinating challenge for Ross McBride, and these wall clocks are a natural extension to his Extra Normal Watches. This wall clock features a laser-cut opening that revolves around the center revealing numbers that signify the hours. A remarkable example of Ross McBride's work is this wall clock which uses the underlying beauty of extreme simplicity, less is more. The Ross McBride Extra Normal wall clock is easy to attach to a wall and works with a single AA battery. The perfect wall clock for the modern home office, business or residence. Ross McBride was born in the Northeastern United States in 1962. He earned his bachelor's degree in graphic design from the California Institute of the Arts, and upon graduation in 1985, moved promptly to Tokyo where he has lived ever since. Ross McBride Ross has exhibited at 100% Design London, Salone Satellite in Milan, ICFF New York, and Tokyo Designers Block, where he won the TDB Award 2003 for best installation design. He has worked on projects for Duende, E&Y, Max Ray, Starbucks Japan, Water Studio, Sharp, and Sony. Specifications: Mineral glass, aluminum case, white dial. The Max Bill clock with lines is easy to attach to a wall and works with a single AA battery. Powered by one AA battery, included. Also includes clip stand for use on a shelf or tabletop.